By which i got an idea to write about it here, So that you all who want to know how to trace an Email Sender's IP, can know about it. 3. The IP written after "Received: from [" is the ip of sender. 2. Click on the arrow beside the "Reply" button on the upper right side of the email. 3. 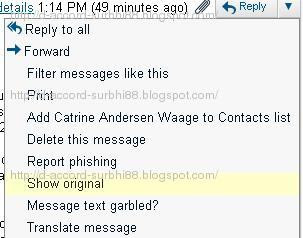 Click on "Show original"
1.Log-in to your Yahoo mail account and open any mail you want to trace. 2.Go to "Action" button on the upper right side of the email. 1. Go to this site to find ip. how can save PC from virous by usb flash drive without any delete any data? @Jitender.... soon i will write a post to tell you and all about how to protect PC frm viruses through usb.